SAS and SAS/AF are registered trademarks or trademarks of SAS Institute Inc., in the USA and other countries. ® indicates USA registration. This class was created after reading and responding to a posting on SAS-L. 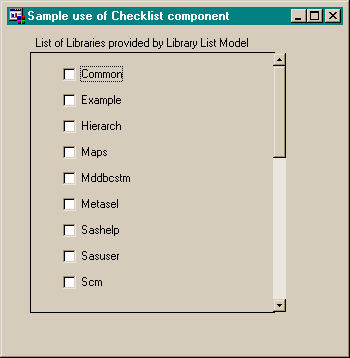 The class is used when you want to display a number of check boxes in the manner of a check list. Since there may be many check boxes, and only limited real-estate, the Check List class is implemented as a sub-class of the Work Area class. The Work Area class supports scrolling of components contained within it. The method setCheckListItems() is used deliver an SCL list of strings to the class. Each character item in the list becomes a check box; the check box label is the value of the item. When a check box in the CheckList is clicked, the object label in the frame SCL will run (if it is defined). Use the object attribute lastCheckBoxClicked to obtain the object identifier of the check box that was clicked. Note: if an area of the CheckList is clicked, that does affect a check box, lastCheckBoxClicked will return a 0. The list attribute checkBoxObjects is used to obtain an SCL list containing the object identifiers of the check boxes in the work area. Once the object identifier is known, developers can alter the display attributes of the check boxes (such as font and border) or query the .selection status. A resource named 'Common.Components.CheckList_r.Resource' was created and a sashelp.classes.checkbox_c.class was added to it. in work area resource attribute>"
The ability to specify an _attrs_ sublist is not documented (at least I have not found it). The attribute name value pairs appear to get merged with the component attributes that are set when the component is instantiated. Attribute name value pairs are foundational in the SAS component object model. Future work on this class could turn it into a viewer for models SclList and StaticStringList. Enforcing or exposing certain object behaviours and attributes might require a rewrite using extended table or table editor as the parent class. This page was last updated 3 June 2002.